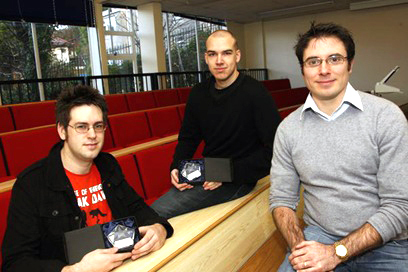 “I was lucky enough to judge the Swansea Metropolitan University’s recent Casual Games Awards. The students presented their projects, based on projects set as part of their syllabus. Tom Orchard won the BSc award showing a strong, commercial idea for a Snickers game featuring Mr T from the A-Team. Richard Morgan won the BA award with a racing game that was not far off commercial standard and a first class side shooter too. There is some very strong work coming out of the University at the moment and we are working closely with them in their second semester – giving the modules a more commercial flavour. We’ll be giving the students a project or two based on real-life commissions with real-life deadlines. Well done Tom, Richard and all of the shortlisted students.